Railpictures.ca - David Vincent Photo: In another attempt to replicate Mr. Mooney’s photo, the crew agreed to attempt to spot the train identically to the spotting on July 27, 1977. While not exact, I think I did much better than my first attempt. It would appear that the new rail in Arnold’s shot (which I presume is currently being used) is about to be replaced. With VIA having taken over the operation of this service in the summer of 2014, the new schedule can reasonably be relied upon. 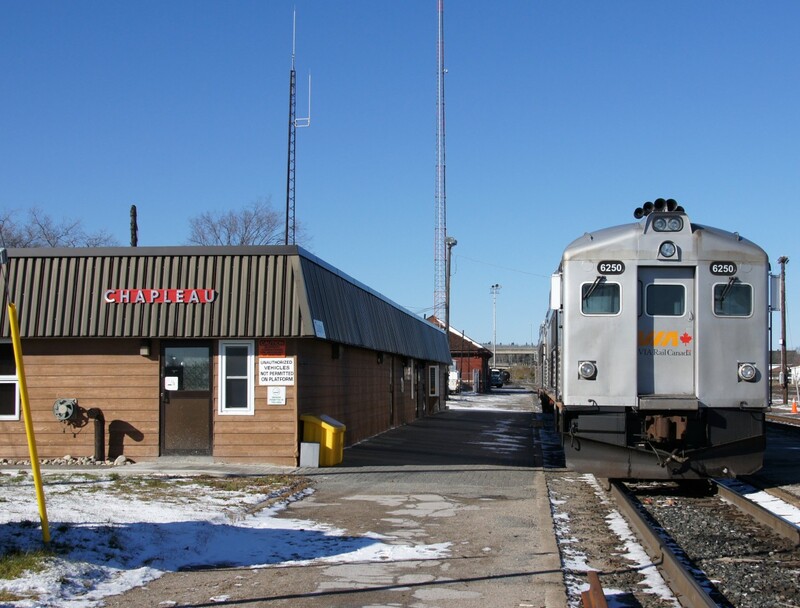 A single VIA crew made up of 2 engineers and 1 Service Manager now works this train for its entire trip from Sudbury to White River, reducing the often hour-long stop here at Chapleau to the amount of time it takes the engineer to print out new TGBOs. The cars are still fueled a few hundred feet to the east, but there are few delays associated with that process. Even factoring in meets, at many times we slowed down to avoid passing scheduled stops early, and ended up arriving on time both ways. Whether you’re looking for a scenic overnight trip or a taste of what you used to be able to see on The Canadian, “the Budd car” offers excellent value for money, a great way to accumulate VIA Preference points, and the food in While River is great! (Try Catz!) The new schedule ensures you see more of the trip than ever before in daylight. | Railpictures.ca – Canadian Railway Photography – photographie ferroviaire Canadienne. Copyright Notice: This image ©David Vincent all rights reserved. Caption: In another attempt to replicate Mr. Mooney's photo, the crew agreed to attempt to spot the train identically to the spotting on July 27, 1977. While not exact, I think I did much better than my first attempt. It would appear that the new rail in Arnold's shot (which I presume is currently being used) is about to be replaced. With VIA having taken over the operation of this service in the summer of 2014, the new schedule can reasonably be relied upon. A single VIA crew made up of 2 engineers and 1 Service Manager now works this train for its entire trip from Sudbury to White River, reducing the often hour-long stop here at Chapleau to the amount of time it takes the engineer to print out new TGBOs. The cars are still fueled a few hundred feet to the east, but there are few delays associated with that process. Even factoring in meets, at many times we slowed down to avoid passing scheduled stops early, and ended up arriving on time both ways. Whether you're looking for a scenic overnight trip or a taste of what you used to be able to see on The Canadian, "the Budd car" offers excellent value for money, a great way to accumulate VIA Preference points, and the food in While River is great! (Try Catz!) The new schedule ensures you see more of the trip than ever before in daylight. Well Done. >big grin< CATZ it is, then! !